Hybrid Camera Revolution: Slashcam 4K Shootout - Panasonic GH4 vs Sony AX100 vs Blackmagic Production Camera! Slashcam 4K Shootout - Panasonic GH4 vs Sony AX100 vs Blackmagic Production Camera! German review site Slashcam has done the first side-by-side of the first generation of <$3000 4K cameras, the Panasonic GH4 , the Sony AX100 , and the Blackmagic Production Camera . Although the clips suffer from YouTube compression and questionable color choices in the grade, there are a couple of things that are clear. First, the GH4 's 50ns shutter readout is almost as good as a global shutter. I had to freeze the frame to see skew/rolling shutter in the "whip pan" at 0:32. It wasn't distracting at all as I watched the motion video - unlike previous generation CMOS cameras. Second, there is a lot to be said for the AX100 's resolution, baked-in color rendition and power zoom. If you don't plan to color grade and don't need the flexibility of interchangeable lenses, this is a terrific little Handycam. Without access to the original files, this comparison is suggestive, but not definitive. That said, the accompanying review provides more insight. Here's another link to the full review. The translation is a little rough, but, thanks to Google Translate, I can't complain about the price. These are all great cameras for their specific purposes. 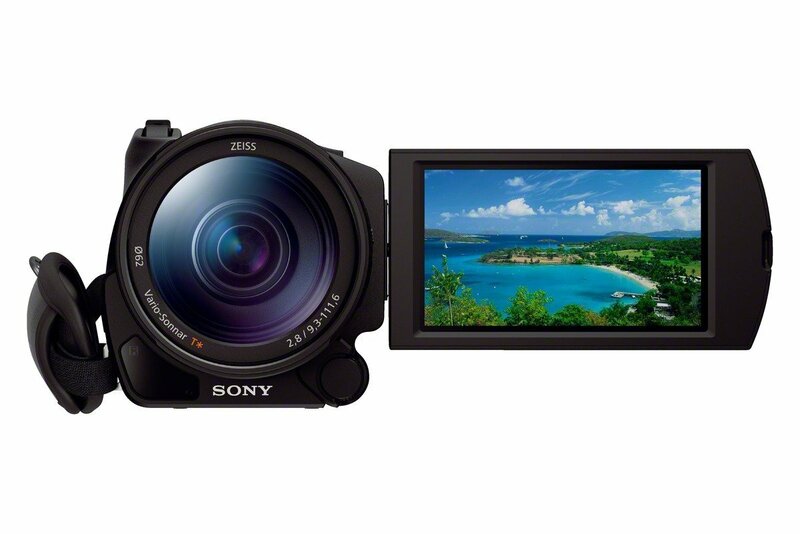 If you want cinema standard 4096x2160, internal recording to SD cards instead of SSDs, interchangeable lenses, a great viewfinder and in-camera color control in addition to gradeability - get the $1698 GH4 . If all you need is UHD, but you want a Super 35 sensor, RAW (eventually) and no rolling shutter - get the $2995 Blackmagic Production Camera - but be prepared to buy external batteries and an external monitor or loupe (at the very least). If you just want to pick up a camera and shoot stunning UHD without the hassle of color grading or changing lenses - get the $1998 AX100 - but be prepared for skew/rolling shutter if you pan too quickly. If you know what you're getting into, you can't really go wrong with any of these cameras.